EOP relies heavily on measures of aggregate consumption at the household level in assessing the extent of poverty and assessing policies. It argues that, with reasonable allowances for differences in household size and (possible) demographic composition and for differences in the prices faced, consumption provides a good measure of economic welfare–command over commodities. such as food, clothing, and housing. However, EOP also recognizes that even a comprehensive consumption measure leaves things out, notably access to non-market goods and intra-household inequalities. So one also needs supplementary data on these things to obtain a more complete picture. Chapter 5 of EOP discusses the attempts that have been made to form composite “mashup” indices that combine these various dimensions into a single dimension. It argues that this approach is often hard to defend and can misguide policy making. Chapter 7 of EOP discusses the measurement and evidence on these non-income dimensions of welfare, and their relationship with measures of command over commodities. The Human Development Index (HDI) aggregates country-level attainments in life expectancy, schooling and income per capita. Each year’s rankings by the HDI are keenly watched in both rich and poor countries. The trade-offs built into any composite index used for assessing social progress are crucial to assessing that index and its implications for development policy. Surprisingly, however, the trade-offs between attainments embodied in indices such as the HDI are rarely given much attention—the HDRs do not appear to have ever quantified the trade-offs incorporated in the HDI. Given that these indices aggregate “income” and “non-income” dimensions of welfare they imply monetary valuation for the latter. The implied value of life in the HDI varies from very low levels in poor countries—the lowest value of $0.51 per year is for Zimbabwe, representing less than 0.3% of this country’s (very low) mean income—to almost $9,000 per year in the richest countries, which is around 10% of their incomes. Given Zimbabwe’s low income, the new HDI gives a marginal weight on life expectancy for 2010 of only 0.0017 per year. Yet Zimbabwe’s life expectancy in 2010 of 47 years is the fourth lowest in the world. By contrast, the new HDI’s valuations of the gains from extra schooling seem unreasonably high—many times greater than the economic returns to schooling. These troubling tradeoffs could have been largely avoided using a different aggregation function for the HDI, while still allowing imperfect substitution. While some difficult value judgments are faced in constructing and assessing the HDI, making its assumed tradeoffs more explicit would be a welcome step. This reflects a a common set of concerns about the (increasingly popular) composite indices of development, including the World Bank’s Doing Business Indicators. The weights are mostly arbitrary, not given sufficient critical attention by users, and there is a large degree of uncertainty about the precise rankings. While we can be reasonably confident about the top and bottom deciles of countries, there is much uncertainty about the middle 80%. This is shown in “The Tyranny of International Index Rankings,” by Bjørn Høyland, Kalle Moene and Fredrik Willumsen. For a more general discussion of the concerns about this class of indices see my paper, “Mashup Indices of Development”. Across the globe, kids from poorer families tend to get less schooling. This has long been seen as an important reason why poverty can persist across generations. 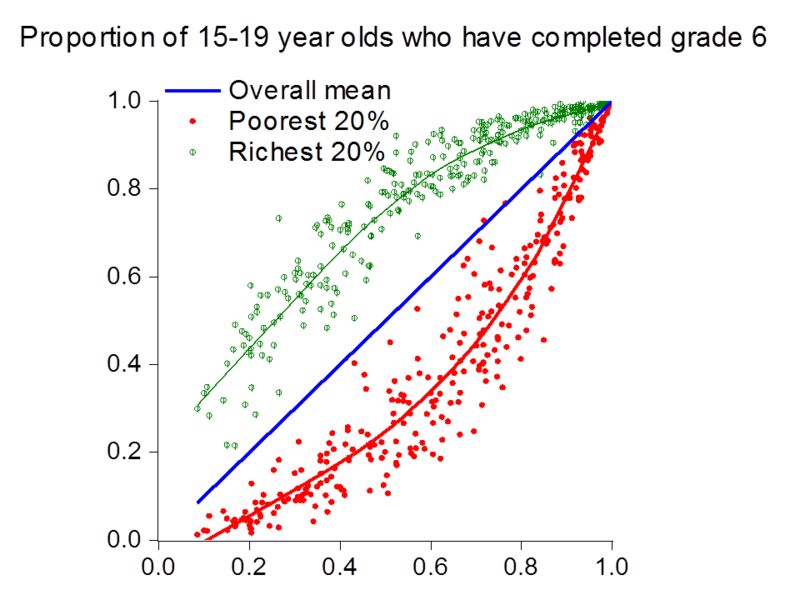 This graph illustrates the socioeconomic disparities in schooling completion rates. 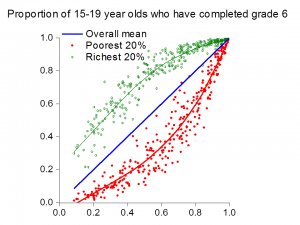 Amongst countries where 50% of those aged 15-19 had completed grade 6, the mean completion rate was 76% for the richest quintile of families but only 24% amongst the poorest. Source: Estimates from Deon Filmer’s “Educational Attainment and Enrollment Around the World.” The poorest 20% and richest 20% are identified using a composite “wealth index” based on the Demographic and Health Surveys. Notice that the absolute gap in schooling tends to rise in the earl stages of a generalized expansion in schooling. This has implications for the evolution of earnings inequality, as discussed in EOP Chapter 8. The quality of schooling is another issue. School enrollment does not imply attendance, and attendance does not imply learning. In India, for example, tests of school age children have found much less progress in knowledge than enrollments; see the ASER report on Trends over Time. There are socioeconomic gradients in many other non-income dimensions of welfare, including mortality and morbidity, nutritional status, and exposure to violence. See EOP Chapter 7 for more.